In space, nobody can hear millions of unusual small creatures, lurking everywhere. The toy team-up of your dreams is here! 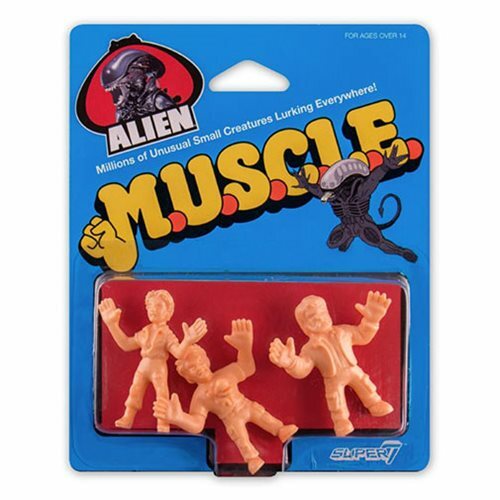 Alien's cast is back as era-appropriate plastic 1 1/2-inch M.U.S.C.L.E. mini-figures. Each 3-pack is individually packaged on a retro card, just like you remember from the original tiny wrestling toys out of Japan. Relive your days as a a terrified space cargo hauler with this amazing assortment of alien attackers and antagonists. Ages 15 and up. Set includes Kane with Chestburster, Lambert, and Dallas.